Here we go again. I am Me basically, I dont wish for much but just a lottery jackpot so i can retire and live happy ever after.. Not too much to ask .. This is me trying to walk in step with the world .. Your blog is lovely to see as usual. Nice of you to drop at my blog and share your thoughts. Amma’s real name is Mata Amritanandamayi and she is know the world over as the Hugging Saint. She doesn’t preach any specific religious doctrine, just to have faith and help others. Her manner of preaching is more like Shri Ramakrishnaji of Ramakrishna Mission using incidents from daily life filled with jokes. She resides in Kerala. Couldn’t find how to approach you so writing this as a comment.Have been following your blog for sometime now. Actually, I have authored a book ” Cricket till I die” and I would really like to get it reviewed by you. The novel is essentially a heady concoction of cricket, office life, love, friendship, dreams, suffering and some more cricket. YEah please do let me know what you want me to do and I will surly give it a read and take it from there Thanks. Thanks a lot for the lovely comments you left on my blog. Your comment on my post about living a guilt free life made a lot of sense. I am really trying my best to live without bothering about what anybody would think about me. Just to inform you that in our June Blogosphere Survey of Indian Blogs, your blog has been ranked as a GOLD blog. Congratulations! Ours is a small, recent blog. We are conscious that many of the blogs ranked high by us will excel this blog in many respects. Yet, we are proud to say that we do the blog ranking with utmost regard to quality, and we are fully committed to fairness in ranking blogs. Can you give me your email id. I need to ask you something.This email which Amrit gave is not working. Hi mannbik@gmail.com should work.. Thanks. I keep hoping about the lotto ticket too! I often come here to your blog and find your content a good read. I’d like you to be part of my British Asian bloggers list. I have started a new section on my blog where I hope to capture information and links to British Asian bloggers and Asians living around the world. I’m in my early stages at the moment but hope to go this list soon. You can find more information about this on my blog and please don’t hesitate to contact me via my blog. I hope to add you soon. Thank you so much for this. would look forward to being in the list .. Thank you .. Will check up on the list by tonight I am away at moment , so when i reach home will do so .. Thank you so much for the visit. Welcome to this blog .. Please do keep visiting. by the way, i am triporna ghosh, a new blogger and i love penning down my feelings and thoughts, if u can just comment on my posts,,so as to make the future posts better..
Bikram I must compliment you on a very enjoyable blog. Thanks for sharing. Bikramji, I have a versatile blogger award waiting for you on my blog. Congrats!!! Yayyyyyyyyyyyyyyyyyyyyyy 🙂 you are here excellent.. I went ahead and tagged you on one of my posts. Please do take this one up when you have the time. I wish I could win a lottery too. I almost, almost, almost won 500 rs once, but lost by a number. Since then, I have given up on lotteries. The best thing about your blog is that I have found many bloggers here whom I can visit and get inspired. Thank you.. for the offer.. Let me know .. Thanks for stopping by my blog and having a look around ! Its nice to come across yours too! in Chrome. I’m not sure if this is a format issue or something to do with browser compatibility but I thought I’d post to let you know. Hopped here from Indiblogger. I was reading through some of your post, and wow what a hilarious, and witty style you got. Laughed out loud ! thanks for making my day cheerful ! Keep it up ! will be back soon ! Bikram, I think its time for to update your about page. It would be nicer to know more about you. If possible, then do include your email as well. let me see what I can change it to :).. but I feel theat the best people who can tell about me are the people I am with.. I dont know what to write about myself .. find it awkward always .. I certainly know that you are a very calm, composed, witty, open and a little shy to talk about yourself. But as a reader of your blog, it would be really nice to get to know you more as a person. Now, it’s upto you to decide, what you would like your readers to know about you. Hello, well I think its been about 5 years now . Advice from me WOWOW.. Thank you for saying that but all i can say is keep writing , people will come.. it takes time.. thats all. All the best.. Thank you for finding my blog and following me. Hi Bikram, i had starte dfollowing you block sometime back, but it was only today that it started appearing in my blog reads. So glad to find it again! Hi Bikram, I found your blog interesting and theme i liked most, I have my reason i have used the same theme for more than a year… have not gone through your other post but your wish for a jackpot is good.. if you get dont forget that i too had pray for it… Kidding Krishna, Keep posting..
Nice blog. It was a nice surprise that our blog names are so identical. Thank you so much and welcome to this blog .. Sadly its been so many years no jackpot yet. But offcourse the day I win I am going to let the whole world know for sure ..
You’ve been nominated for the Liebster award! 🙂 Check it out! Welcome here and thank you so much.. Please do keep visiting .. 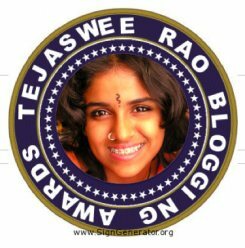 Your blog is awesome, vry good writings, need learn a lot from you. Keep on rocking :)When you get free time, do chk my blog. Welcome here and do keep visiting. Welcome welcome to this blog .. Thank you so much for visiting .. Please do keep visiting. wowow such lovely words for this blog..
It’s my pleasure to inform you that, I have nominated you for ‘THE ONE LOVELY BLOG AWARD’. So, please feel free to accept this award. Once again.. I love to invite you to do a cool challenge called ‘3 days quote challenge’. Hope you enjoy as much I’m doing. Thank you so much for the follow. Guess what I am here and I read your post about Punjab and its farmers. One needs heart to understand the struggle of others which is lacking in majority out there. But that should not stop us from raising our voice…we can at-least do this much. Isn’t it? indeed we need to voice because the art of farming is dieing and I am sure in another 40 to 50 years people will stop to do any farming and we will be importing most of the stufff..